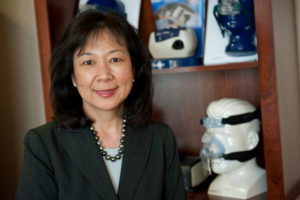 Phyllis Zee, MD, PhD, the Benjamin and Virginia T. Boshes Professor of Neurology and director of the Northwestern Medicine Sleep Disorders Center was a co-lead author of the study that found a synthetic cannabis-like drug reduces sleep apnea. Participants in the trial had reduced apnea and decreased subjective sleepiness, according to the study, published in the journal SLEEP. “There is a tremendous need for effective, new treatments in obstructive sleep apnea,” said co-lead study author David Carley, PhD, the Katherine M. Minnich Endowed Professor Emeritus of Biobehavioral Health Sciences, Medicine and Bioengineering at UIC. The drug treatment was a new approach in that it targeted the brain rather than the physical problem of collapsing airways. This reflects the new belief that sleep apnea is not just a physical problem but may be caused by multiple factors. One of those is poor regulation of the upper airway muscles by the brain, said co-lead author Phyllis Zee, MD, PhD, the Benjamin and Virginia T. Boshes Professor of Neurology and director of the Northwestern Medicine Sleep Disorders Center. Coauthors on the study include Bharati Prasad, Boris Vern, Hui Xie, and Chengbo Yuan, all of UIC; and Kathryn Jean Reid, PhD, research associate professor of Neurology in the Division of Sleep Medicine, Roneil Malkani, MD, assistant professor of Neurology in the Division of Sleep Medicine, Hrayr Attarian, MD, and Sabra Abbott, MD, PhD, assistant professor of Neurology in the Division of Sleep Medicine, all of Northwestern.